April 21, 2017, New Delhi:There is a very pertinent and clear difference in the government and private school education system in India. Every parent wants their kids to study in a private school and get a good education. But with better education comes a higher cost and in many cases as parents across the country report, fee increases in the range of 10-40%. Parents, who are seeing salaries/earnings increase by 0-10% are feeling the squeeze as the increase in school fee is much higher. 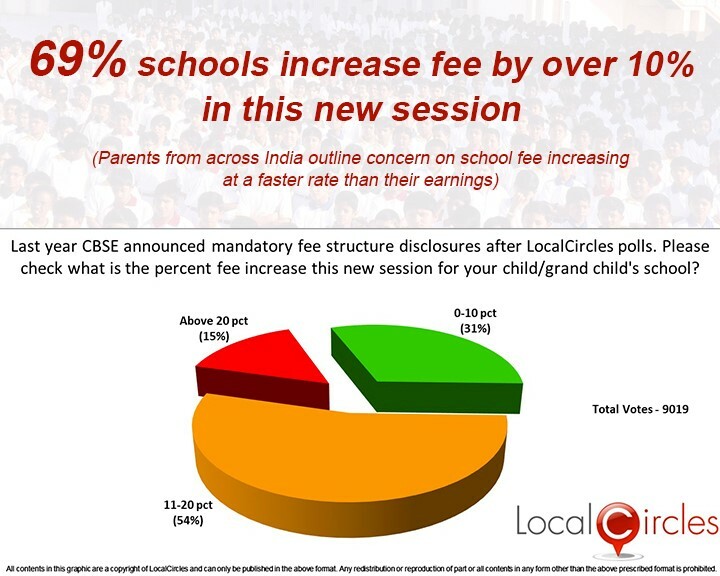 After a LocalCircles survey in September 2016 about better school fee disclosure and transparency, CBSE had mandated that all schools to disclose their complete fee structure on their website. Till the last report, more than 75% of the schools had complied with the order. The issue of school fee hike came up again in late March this year and parents in different parts of India made down to street protests against fee hike. 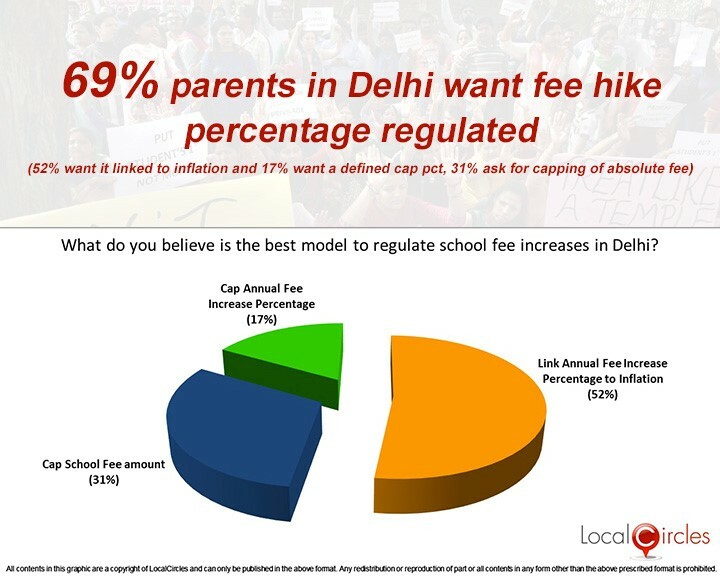 Another LocalCircles survey a few weeks ago, showed that the fee hike has been anywhere between 10% and 30% in different parts of the country with 69% parents reporting hikes in fee above 10%. Post this survey and protests in different parts of the country, some administrators have started taking action. Some states like Uttar Pradesh are looking at bringing a bill similar to Gujarat’s Regulation of Fees Bill 2017, which was cleared by the state Governor recently and suggests a fee cap for primary, secondary and higher-secondary schools at Rs 15,000, Rs 25,000 and Rs 27,000 respectively every year. Those schools in Gujarat who want to increase their fees will need to approach Fee Regulatory Committee with their request. The Minister of HRD has also sought details of the Gujarat bill to evaluate if CBSE should implement a similar model. 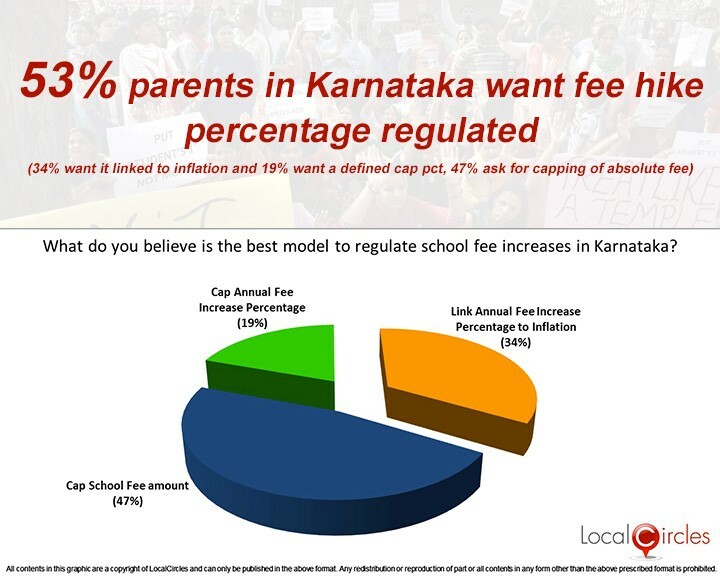 Based on feedback of citizens on the Gujarat bill and the challenge of excessive fee increases as reported by thousands of parents on LocalCircles, another survey was conducted to understand what would be the best model to regulate school fee hikes. 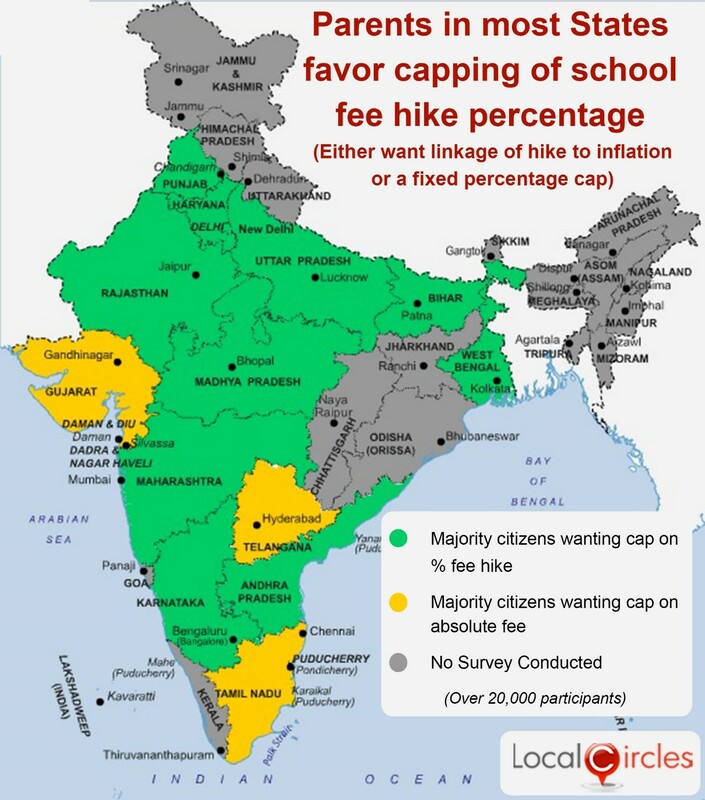 In this survey out of the 9,200 citizens from across 200+ districts of India, 64% are in favour of a cap on school fee hike percent while 36% are in favour of capping the absolute school fee amount. 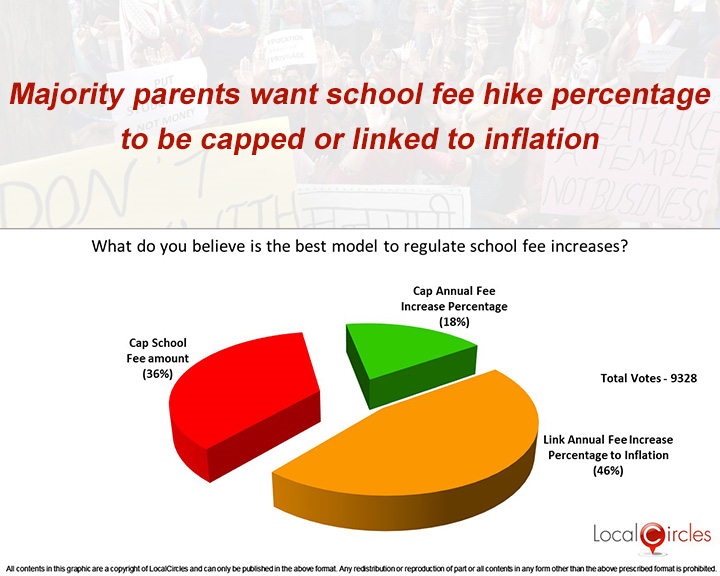 Amongst the 64% in favour of capping the percentage hike, 46% want the school fee hike percent to be linked to inflation while 18% support a pre-defined cap that is not to be exceeded. Majority of the parents i.e. 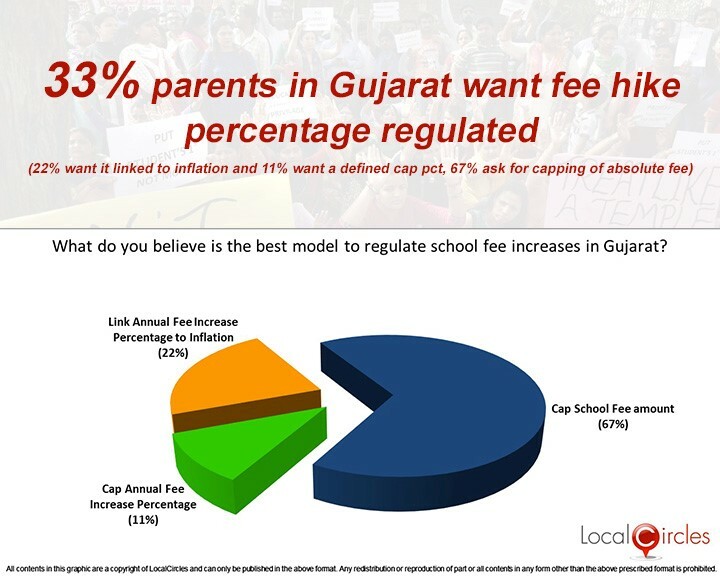 64% are not in favour of putting a cap on absolute fee like done in the Gujarat bill as they believe that this will lead to closure of high quality schools or lead them to scaling down their set ups. Per some of the parents, if they have made a conscious choice to pay an amount X, they have already planned for it. It is the excessive annual increases that are to be regulated so the amount in future years doesn’t exceed the plan. Some parents have given the example that a 5 or 7 star hotel should not be forced by the Government to provide 3 star services as they are not set up for that. 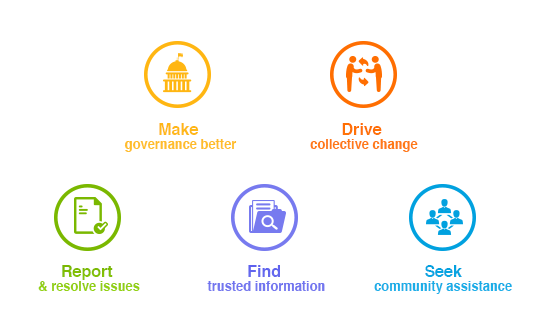 LocalCircles will also share the results of polls with key stakeholders in the area of school education i.e. Ministry of HRD, CBSE and State Education Departments so actions can accordingly be taken to regulate school fee. 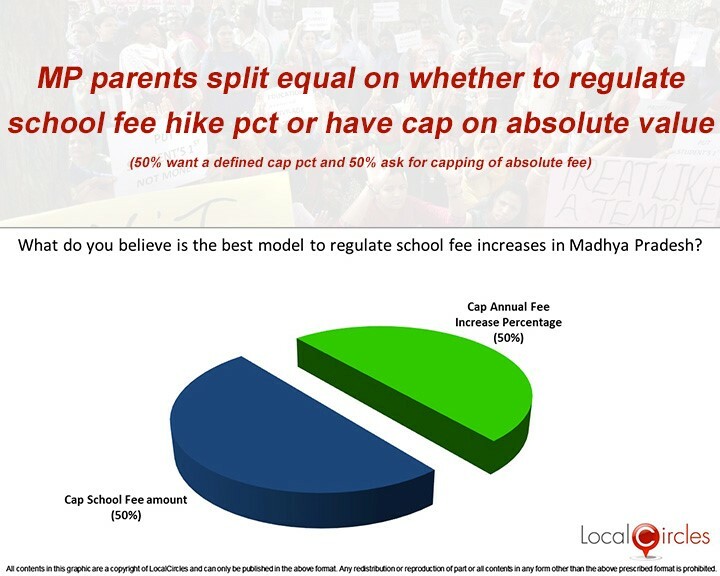 LocalCircles conducted state wide surveys in large states of India and majority parents in most states want cap on fee hike percentage implemented instead of a cap on absolute fee. 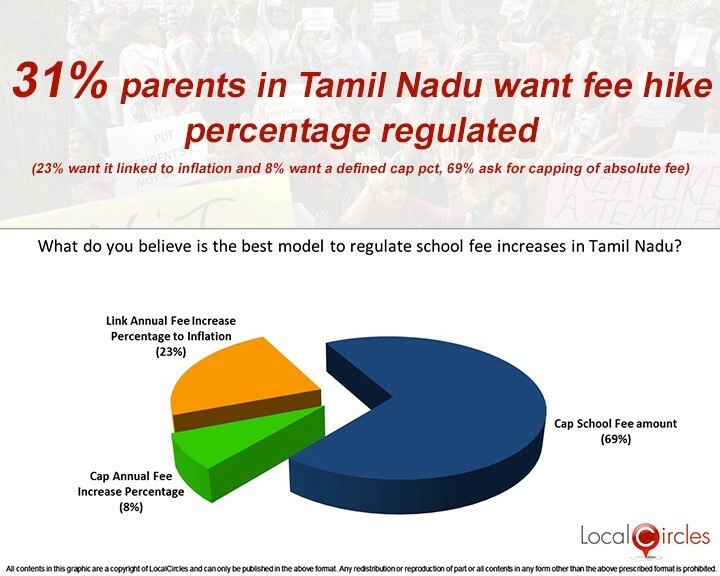 Majority parents in only 3 states of Gujarat, Tamil Nadu and Telangana are in favour of cap on absolute fee while majority parents in 10 states of India want a cap on fee hike percentage implemented. Parents in these 10 states either want the fee hike percent tied to inflation or a predefined cap which would not be exceeded by schools. 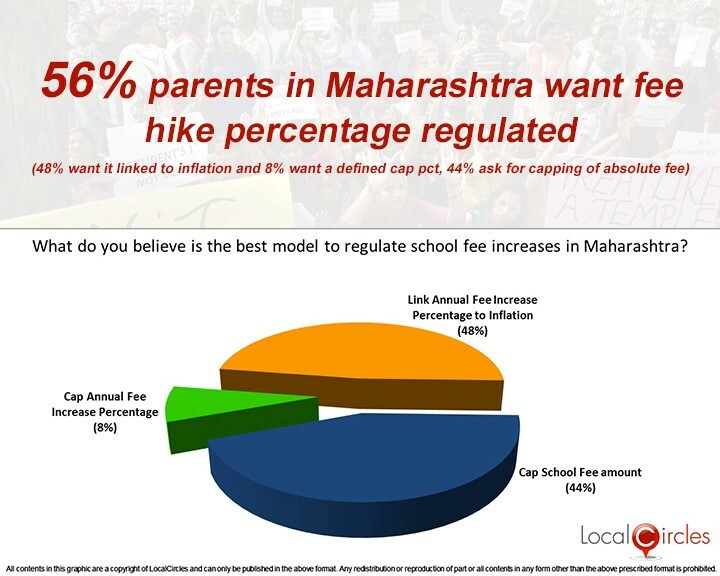 Below are the state level polls indicating the pulse of the parents by state on the issue of regulating school fee. 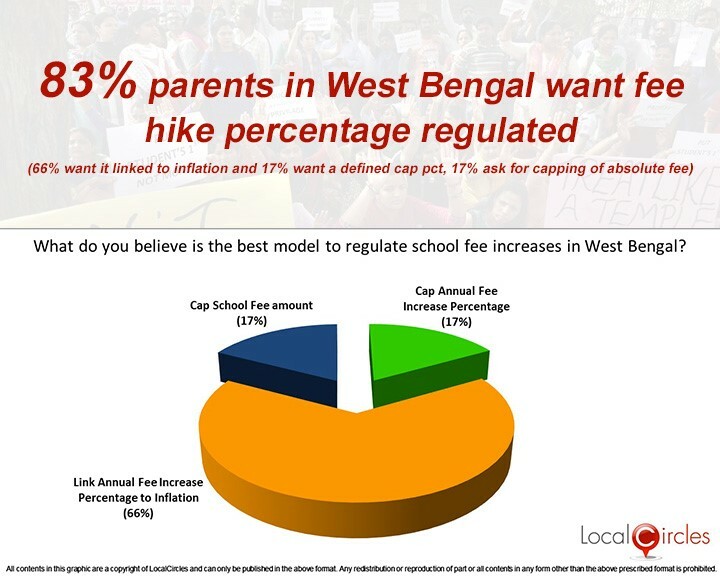 In a related state level survey which was done in 17 states in early April, most parents expressed their discontent with the excessive fee hikes. More than 75% parents from Haryana, Andhra Pradesh, Kerala, West Bengal, Rajasthan, Uttarakhand, Jharkhand and Goa said that their child’s school has increased the fee by more than 10%. 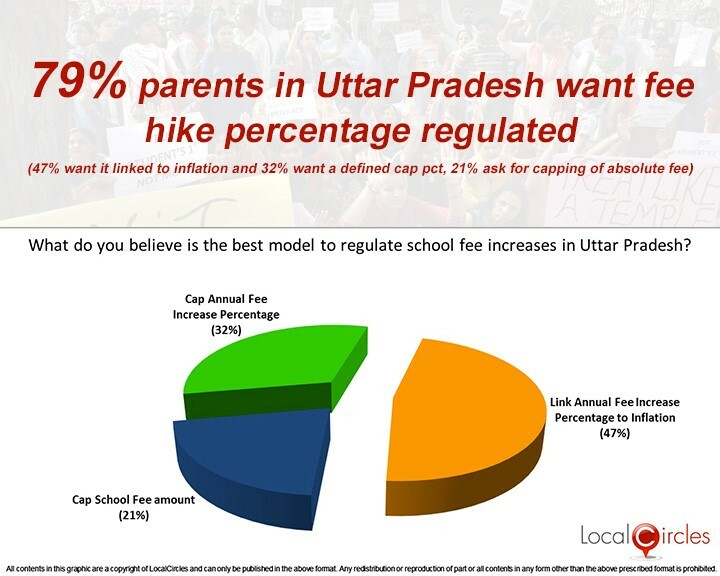 50 -75% parents from the states of Uttar Pradesh, Maharashtra, Madhya Pradesh, Telangana, Karnataka, Tamil Nadu and Delhi said that fee hike has been more than 10%. Only Gujarat and Bihar were the two states where parents said that majority of the schools have increased the fee by less than 10%.